This handbook is designed to provide you with helpful information about the Conference and your important role in advancing the mission of Jesus Christ in Massachusetts. Meeting Registration materials, posted here. For help with registration, meals or marketplace rentals, or to volunteer to help, contact Deb Holmes, Registrar, holmesd@macucc.org. As a delegate from a local congregation, you represent your congregation at the annual meeting of the Conference. Familiarizing yourself with the contents of this guide, especially the by-laws and standing rules of the Conference, will help you to effectively carry out your responsibilities as a delegate. Prior to the Annual Meeting you will receive a packet entitled “Advance Materials”. This will include information on registration, meals, and resolutions to come before the meeting. Carefully review all the materials. d. Special congregational meeting, perhaps after Sunday worship. 2. The annual meeting is open to all. Invite other members to come to annual meeting with you. 3. Make the entire congregation aware that you are their delegate of the upcoming Conference Annual Meeting, and what you will be doing on their behalf at the Annual Meeting. The Conference annual meeting is a wonderful opportunity to meet other UCC people from throughout Massachusetts, to participate in deeply moving worship, and to engage in the governance of the Massachusetts Conference. When you register, you will receive a packet including additional material, including the schedule and location of annual meeting events. During the annual meeting, there will be hearings on the resolutions to be presented. This is an opportunity to ask questions and to suggest changes or improvements to the resolution. Included in this guide are the standing rules that pertain to resolutions. You should familiarize yourself with these prior to annual meeting. 5. 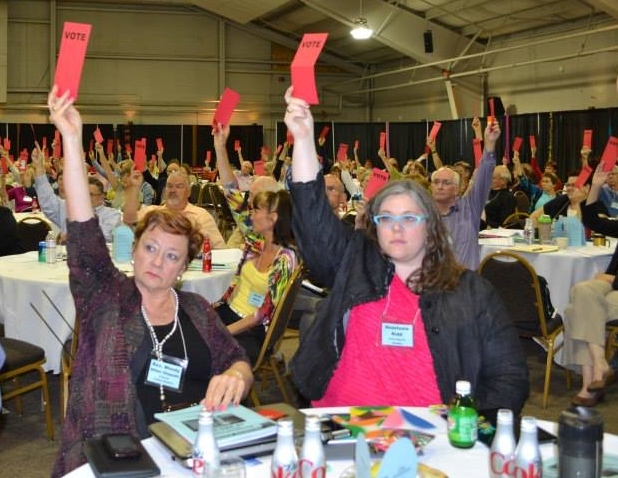 Encourage your congregation to get involved around issues raised in resolutions. For example, many churches discussed and then decided to switch to offering Fair Trade coffee during coffee hour and at church functions in response to a resolution passed at annual meeting on Fair Trade. 6. Share the information about “Super Saturdays”, the twice yearly conference-wide gatherings for workshops, worship and fellowship to be held each Fall and Spring. As a Delegate attending Annual Meeting, you will receive a special discount to attend these events, which are transferable to other members of your congregation if you cannot attend. During this time you can make an important positive impact on the health of your congregation and the Conference. You are a primary conduit for communication between your congregation and the Conference. Check the website (macucc.org) regularly. Make sure all your boards and committees are aware of the resources, services and upcoming events that are available to them. Educate yourself about the mission and work of the Massachusetts Conference and the wider church. Then share this with your congregation on an ongoing basis. Visit your mission/outreach committee, or whatever other board or body recommends the amount to be given to Our Church’s Wider Mission. Make sure they understand the importance of this work and advocate for its generous support. Make sure your church’s budget includes payment of Fellowship Dues in full. Educate the treasurer, trustees and the congregation about Fellowship Dues and all the ministries it supports. Encourage attendance at “Super Saturdays”, an incredible opportunity for the training and development of your lay leadership. This is especially effective when church members attend as a team. Similar to the Conference Annual Meeting you will elect leadership, approve budgets and often have special workshops, worship and presentations. Ecclesiastical Councils approve candidates for ministry. This is one of your most important roles as an Association delegate! You will have the opportunity to question candidates on such issues as their call to ministry, theological perspective, gifts, skills, their understanding of the needs of the local church, support for the United Church of Christ, integrity, and preparedness for ministry. Ordination is a major event in a person’s life and should be celebrated! Pastors are ordained on behalf of the entire United Church of Christ. The presence of both clergy and lay delegates at ordinations provides a powerful symbol of support and membership in the wider church for both the person ordained and the local church they have been called to. An installation service represents the covenant between the Association, the local church and the new Pastor. Presence at installations by lay delegates from other churches lets the local congregation know that they are part of a wider church that cares about them and celebrates with them. Learn about the history of the Massachusetts Conference and about the United Church of Christ in general here. The UCC is a church of many "firsts". Learn more here. Learn about organization and governance in the Massachusetts Conference here: Associations and Regions. The mission of the Massachusetts Conference, UCC is “rooted in the grace of God, to nurture local church vitality and the covenant among our churches, to make God’s love and justice real”. The most recent Annual Report tells stories of significant new initiatives and provides an overview of Conference ministries and the budget. Major activities are also summarized below. Over 60 conference sponsored events each year! What is United Church Mission? What does it support? Learn more here. Annual Meeting is governed by Standing Rules which are voted by the delegates each year. The most current Standing Rules may be found here. The current bylaws of the Massachusetts Conference are posted here.